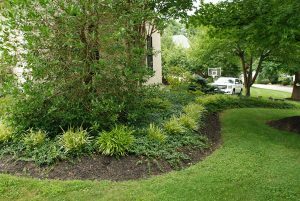 Whether you are looking for basic backyard landscaping or a complete multi-feature project – B. DeMichele Inc. is your leading expert for landscaping! We continue to be your area specialist for all aspects of landscaping, hardscaping and landscape design build. Our area has always been a prime location for outdoor living, with many outdoor activities during the winter and summer. Most area residents maintain a strong desire to be outside, entertain outdoors and showcase their backyard landscaping. It seems that “keeping up with Jones’” mentality has a large effect on what people desire to see in a typical landscape project. B. DeMichele Inc. is a local based landscape design build company that specializes in all aspects of your complete construction needs. We have lived and worked in this area for over 20 years, we understand all the local niches, the HOA’s, the city requirements for permitting and engineering, etc. Our expertise extends throughout these local areas: Delaware County and Chester County in PA, southern New Jersey and northern Delaware. 1. 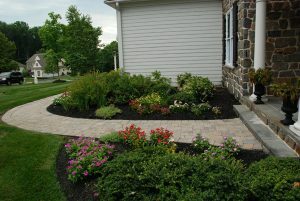 A typical landscape project requires just a few of the basic features. A good irrigation system is the backbone in all of our landscaping projects. All plants and trees require adequate irrigation, proper drainage, and routine fertilization and care. 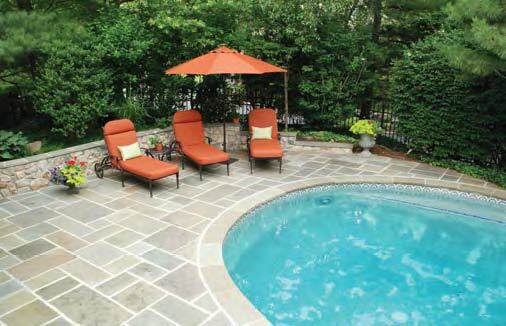 Landscape rock/gravel, concrete patios, and maybe some grass are the “basics” in every backyard. Make sure a premium irrigation system is a primary focus, it will pay off in water efficiency & ease of use. 2. Create a focal feature – this can be a water feature, fireplace, large tree, etc…. Anything to anchor the landscaping in your backyard. Front yard landscape focal feature? Well, this should be your house! 3. All of our local residents are content with the basics, but those serious about outdoor living have got to “splurge” with a few “must-have’s”! The builder patio (10’ wide x 10’ long) is out, and patio extensions are in! Most of our landscape designs factor in more patio space, and entertainment features such as a small fire pit, swimming pool, water feature or fully equipped kitchen. 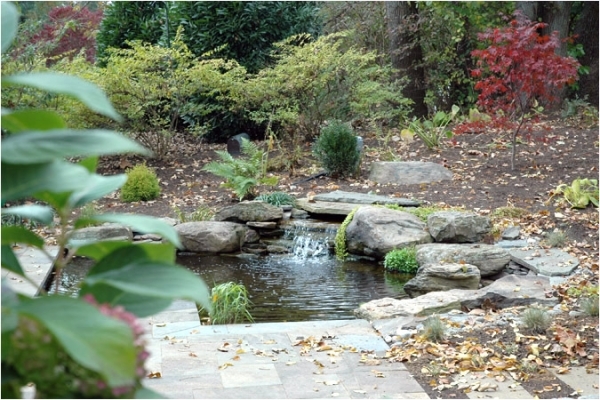 A good landscape project has something different, a focal feature, etc. These items do require our clients to increase their landscape budget a bit, but it’s well worth it – for the immediate impact in their new backyard landscape. 4. The truly committed backyard enthusiast is dedicated to outdoor living. The lifestyle we have grown to love is completed by a magnificently landscaped backyard. B. DeMichele Inc. maintains the highest population local landscapes and our “PREMIUM” clients wouldn’t enjoy the outdoors as much without our high pressure mist system, lighting systems, water features and outdoor kitchens. Our most popular items these days are our travertine paver patios, custom fireplaces and fire channels, and resort-style water features. These features complete our “Premium” landscaping projects. 5. Invest in a B. DeMichele Inc. landscape design. Many people are looking for the best deal and who can get the project done quickly and efficiently. In doing so, they are making the single biggest mistake in the landscape industry – NOT GETTING A MASTER PLAN. Our landscaping experts can help. Why not take advantage of this? As a professional landscape design build company in your area, we can’t emphasize enough the importance of having a well-planned master landscape design plan. It allows both client and designer to review, comment, criticize and “sleep-on” every aspect of the project. Our landscape design plan also allows for a more detailed and accurate cost-breakdown, documentation for a landscape agreement, and future references to a complete landscape project (which may be needed years down the road). The final benefit for landscape design allows for our clients to “phase” a project into different installation phases, while having an ultimate plan or goal for the project. • Irrigation Systems – As energy consumption and water usage becomes more important in today’s GREEN industry, B. DeMichele Inc. offers many irrigation solutions that are industry leaders for water consumption & water efficiency. We use irrigation products that continue to allow us to offer solutions for better pop-up sprinkler heads, drip system, and valves. Our irrigation controllers are easy to use, expandable, and have a great warranty. 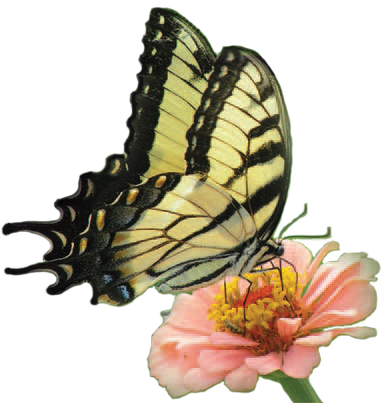 • Plants & Trees – Most local landscape companies specialize in plants and trees – and that’s it. It’s easy for companies to save money and lower prices in this category by not providing soil-amendments for newly planted items, or by charging extra for double-staking trees. 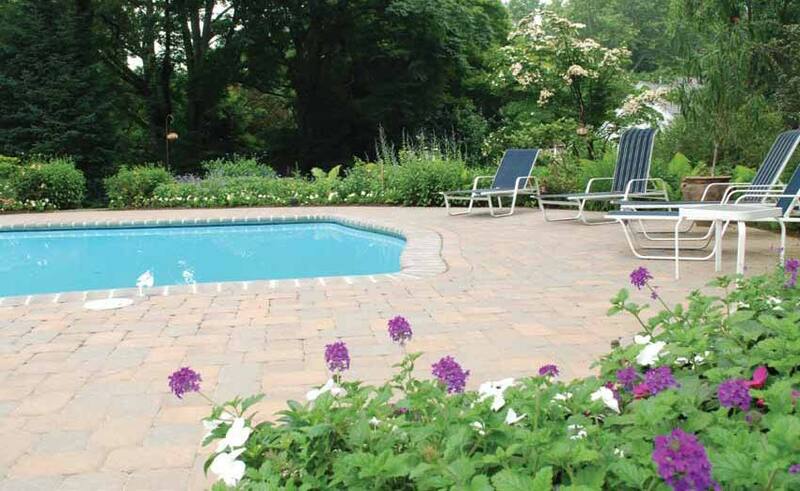 At B. DeMichele Inc., these are included in all of our estimates, since it’s a necessary part of providing longevity and sustainability to our landscape projects. • Landscape Design – We offer free professional landscape designs for all of our projects. These designs are Landscape Architect quality designs, and they are complimentary to our clients! We will put our landscape designs and planning up against any other company in the local area! 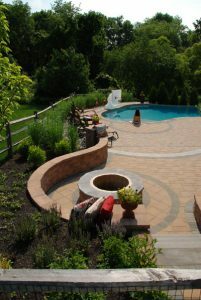 Each B. DeMichele Inc. landscape design plan is guaranteed by B. DeMichele Inc.
• Masonry & Hardscapes – We have full-time masonry and hardscape crews that also understand local landscaping and irrigation. We find it’s best to have the same crew working on a project from start to finish. On top of that, our masonry and patio experience continues to get recognition as one of the best in the area!